Posted on February 23, 2014 by Greg C.
I have been to Austin for 10 SXSW events and countless other times to visit Dell when I was at AOL. Â I consider myself a veteran of SXSW and while I am taking the year off going, I thought I’d share some advise on where to eat in Austin. The Driskill, home to the Texas Waffle is the most consistent breakfast place within walking distance. Magnolia Cafe South is also a solid place for breakfast. Â Lots of the technorati hang out there. Franklin’s BBQ is a must, but you have to get there around 10A. Â Bring friends because you’ll be waiting, but it is worth the wait. Casino El Camino is my favorite place on 6th for food. Â Don’t let the outside or inside scare you, go to the back window, order a burger and then take it to their courtyard in the back. Juan in a Million is a bit of a trek from the convention center but this place is an institution. Â I usually stop on the way from the airport since it is in between the airport and downtown. Going to Salt Lick only counts if you go to the one in Driftwood. Â I’ve never been to the Round Rock, but the airport does not count. 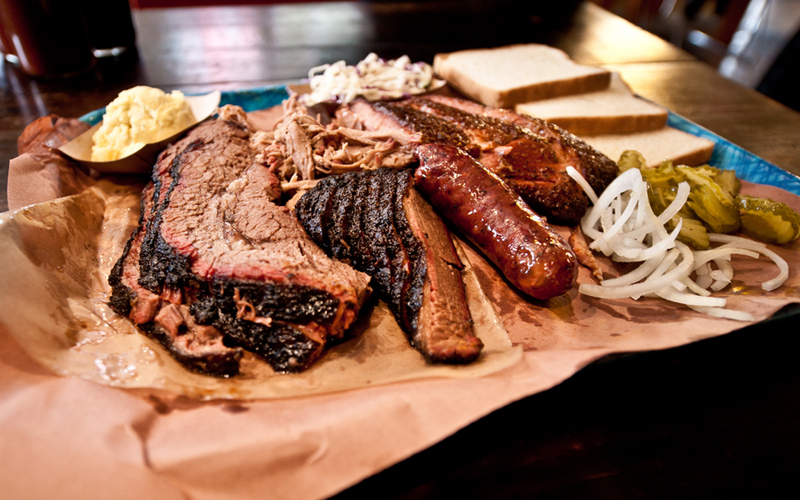 Â Salt Lick takes advantage of being the only open pit fire BBQ joint around. Serranos is really good Mexican up near the capital. Â The setting is cool too in front of an amphitheater. Uchi for sushi is great especially given the location. Â You are guaranteed to always run into someone famous during the SXSW week. Â A couple of years ago I was seated next to Matthew McConaughey. Gourdough’s for crazy, awesome donuts. Â Its a food truck usually parked south of the lake. This one most visitors miss because it is a local place, but the Broken Spoke is straight out of a movie. Â Many seasons of Friday Night Lights were filmed there. Â Just go there, order a few pitchers of beer and dance to the live music. Do an early morning walk up to the Capital. Â You can walk right in and see both chambers. Franks, for hot dogs after hours is always a sure way to ease into your inevitable hangover. This entry was posted in Uncategorized and tagged SXSW, sxswi by Greg C.. Bookmark the permalink.